This class is designed for children 3 to 5 years of age. Children will learn their letters and phonics through song and dance while simultaneously learning music appreciation. This class is a great way for young children to enjoy learning, while developing the foundation to continue on to private instrument instruction, if they choose. Private lessons are one on one instruction in the instrument of your choice. Students can sign up for 30 minute lessons or 60 minute lessons. It is suggested that students attend at least one lesson per week. Students will learn the proper way to sit at the piano and placement of hands. Musicianship skills such as note reading, understanding of rhythmic patterns and ear training will be taught in each lesson. Students will understand the basics of music and playing the piano. 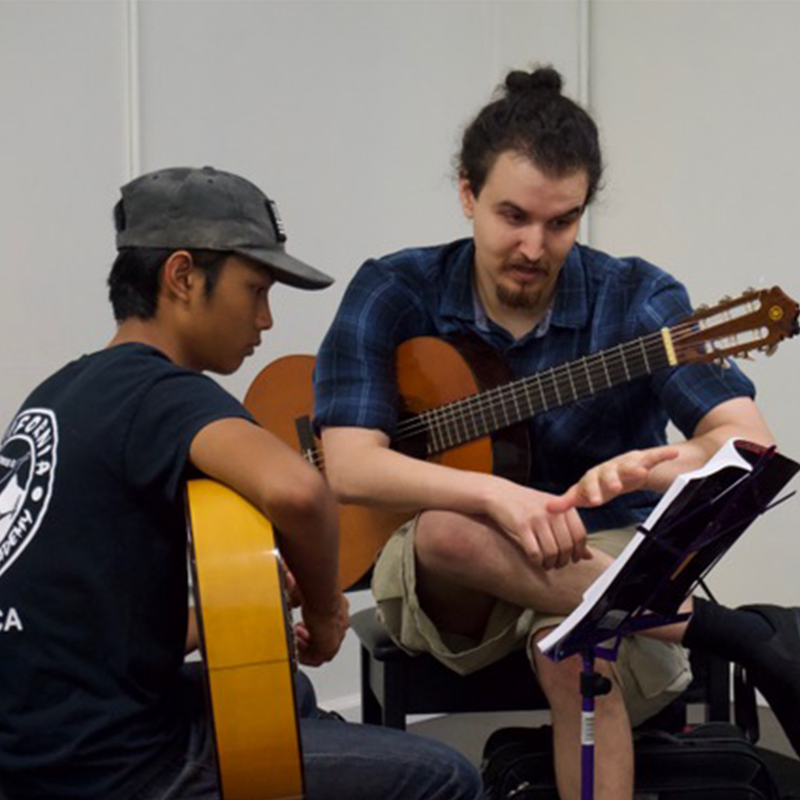 Students are taught to play the guitar according to their experience and goals. Beginners will learn to play simple tunes while being introduced to technique, posture, reading, and overall familiarity with the instrument. For experienced musicians and guitarists, our instructor will expand their knowledge and offer advice on technique, performance, and assists with new and advanced material, song writing, and repertoire. Voice lessons will focus on developing the students breathing technique, vocal warm ups and assistance with choosing suitable repertoire. Students will also learn performance poise and basic musicianship skills such as basic note reading, rhythm patterns and ear training. Students find out how drummers use 4 limbs to do 4 different things at the same time to create 1 breathtaking beat. First you will learn how to differentiate your senses by reading drum notation & hand control, gradually you will get behind the drums & start playing your first beat. Intermediate students will learn advanced skills & methods to play odd time signatures & incorporate your knowledge with other musicians to become an industry professional. Acapella experience is a FREE class we offer to students and/or people in the community where we learn the basics of singing and learn how to sing Acapella in a group. Is a group class, students must be signed up for private lessons in conjunction with this class. This class explores the techniques needed for putting on a live broadway style musical. Students will work on singing, acting and dancing. At the end of each session there will be a live performance put on by the Musical theater workshop students. This class is designed for children ages 5 years and up. We meet Friday’s from 6:00 p.m. to 8:30 p.m. and Various Sunday’s throughout the season. Sign ups for this class are by show, which take place every fall.